Please note: Most YogaUOnline courses qualify for NON-CONTACT Continuing Education hours. Please see the guidelines below from Yoga Alliance for teachers who qualify for offering continuing education. Yoga Alliance currently has two systems for submitting continuing education hours: Through the old system and on their new YACEP system. Please note that YogaUOnline's courses are not offered via YACEP, so you will need to submit hours through the old system. Below, please find the Yoga Alliance guidelines for this and how to submit your hours. What is a Continuing Education Non-Contact Hour? Registered Yoga Teachers are required to submit a written reflection or evaluation of each activity, to demonstrate what was learned and how it relates to one or more of our Educational Categories. Who May Offer Continuing Education? *Yoga Alliance reserves the right to request supporting documentation from RYTs to substantiate the qualifications of any non-YACEP Continuing Education Provider. 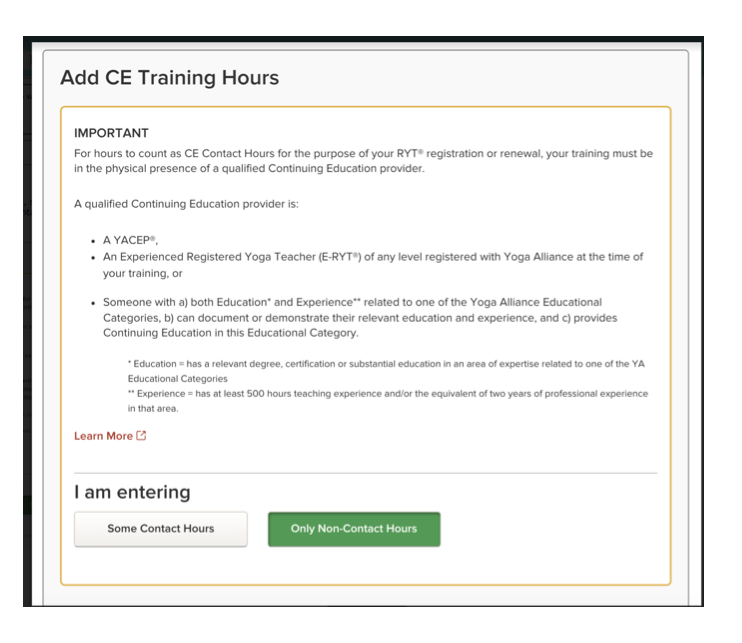 visit “My Teaching Hours” and select the green button to "Add Teaching Hours"
visit “My Training Hours” and select the green button to "Add Training Hours"
The CEU's earned on YogaUOnline are non-contact hours with a non-Yacep provider. So, to submit them, follow these steps. 2. 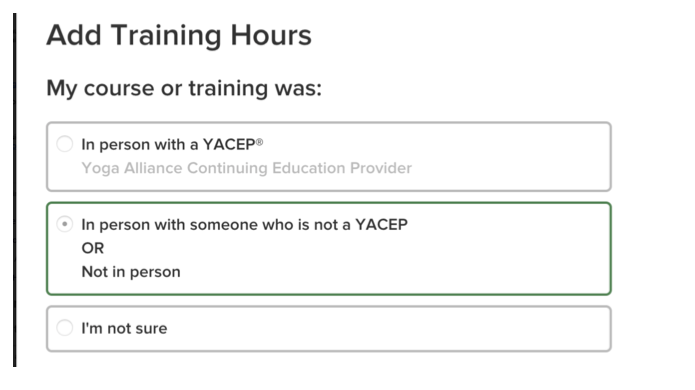 Under Add Training Hours, check the option for In person with someone who is not a YACEP. 3. Under Add CE Training hours, select the button that says Only Non-Contact Hours (in green below). Then follow the prompts to enter the details of your training. Please Note: You can enter up to 20 Non-Contact hours for the 30 hours of Continuing Ed requirements with Yoga Alliance.